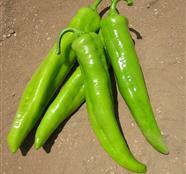 Light green Ananheim hot pepper. Upright, vigorous plant, suitable for trellised cultivation. The 18 cm long, 4 cm wide fruits, are light green to yellow in color, with high pungency. Bolt F1 sets well under hot and cold conditions, maintaining good pungency levels. High yielder throughout the growing season.